I sure hope I’m still on good terms with my guardian angel because I’m about to walk barefoot on hot coals. Now folks, before I move on, you need to know, I love my fellow breeder/exhibitors and am not, in any way, shape, or form finding fault with anyone’s breeding or dogs. What I do intend is to help newbies learn what more experienced breeders and judges see as they wade through a class of Gordon Setters or sort through a litter of puppies. So bear with me, and know that I’ve randomly chosen from a huge group of photos. I did the best I could to crop those photos to prevent identification, so if you spot your own dog and don’t like the way it looks…KEEP QUIET…you can pretend it’s not your dog and no one will be any wiser! Also, everyone needs to remember that this is one shot, a blink of the eye, this particular dog may actually move beautifully but in the instant that the shutter snapped something not so great may have been captured…remember all those awful photos your mother took of you when you were little? And finally, I’m asking all my photographers to forgive me for not identifying their work in this particular article, there are those who would go hunting through Facebook photos and the like to try to figure out which dog belongs to who, and our purpose is to educate, not to find fault! 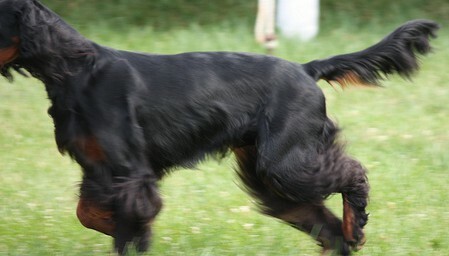 Well, now that I’ve filled a page creating a disclaimer hoping to survive yet another day, let’s move on to the subject itself, learning to understand the breed standard and apply it to a living, moving Gordon Setter. I decided to start the movement discussion with what I consider to be the easiest thing for everyone to see when watching a class of dogs move, that being the topline. The topline can tell you so much about what’s going on under the dog as far as the reach and drive we expect to find. 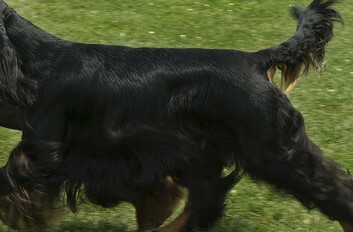 A properly moving Gordon Setter will display a good moving topline and a good topline is an indicator of balanced angulation front to rear. Remember, we are not talking about the dog’s topline standing still, we want to learn to look at that topline while the dog is moving. 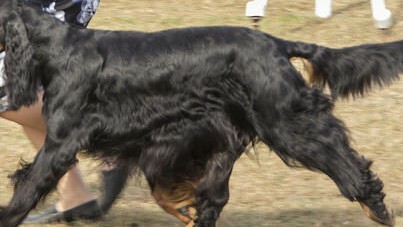 If a Gordon Setter has a proper front assembly and a proper rear structure with corresponding angulation that is in balance on both ends, the topline will appear as one smooth, moderately downward sloping line that literally appears to be floating around the ring. By looking at the topline first you will soon learn where to look next for good reach and drive under the dog. 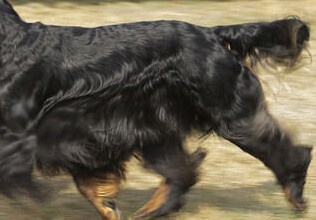 Dogs who move carrying the correct topline will be the ones most likely to exhibit the correct reach and drive underneath the body. 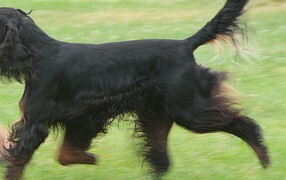 If, for example, you see a dog moving high in the rear, you are likely to notice that they lack reach in the front, the rear being over angulated as compared to the front, rises as the dog must compensate somewhere to keep his hind legs on their forward drive (with their longer stride) from striking the front legs (because of their shorter stride). 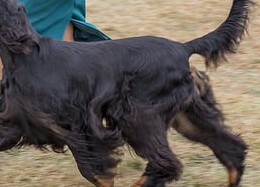 A dog who roaches, or arches over the loin may do this because of improper or unbalanced angulation or because of improper structuring of the back. 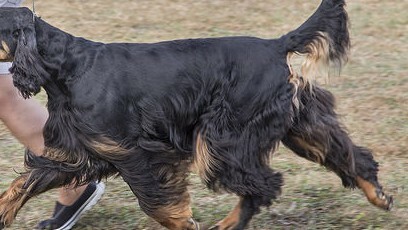 Generally the Gordon Setter, like many breeds, will have a front assembly that lacks proper structure more often than the rear, but that my friends is a story for a different day. 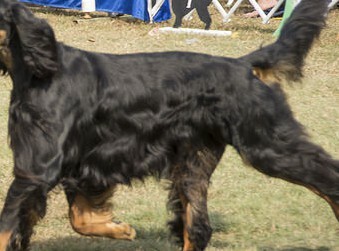 So first some quick excerpts from the Gordon Setter Breed Standard to remind you of some things we should be looking to find during our topline study. Now let’s move on to look at some moving photos to see if we happen to agree on the things that stand out. Let’s also remember, this is what the judge sees on that first go-round, many a win is earned on the first impression. Moving high in the rear, tail is set low off the croup which is angled too steeply cause the tail carry lower, also notice the break in midway in top-line. Is this dog balanced front to rear? Slight roll over the shoulder, moving high in the rear with a low tail set due to improper angle of croup. Nice strong top-line, all parts fitting smoothly together, angle of croup is nearly flat resulting in tail carried straight off the back. Nice strong top-line with no bumps or dips, croup angled correctly allowing tail carriage straight off the back. Top-line looks fine, level back, good tail carriage, proper croup, would like to see a bit more slope to the top-line but it’s level or nearly so. All parts fit well here, this is a good strong top-line, croup and tail set are good. This top-line has improper arch (roaching) over the loin, croup angled a bit steeply resulting low tail set. This puppy’s gives us a level back but unfortunately it drops off sharply in the croup and results in a low tail set. Angulation is not balanced front to rear resulting in top-line that moves high in the rear, also a drop to the croup, tail-set is too low resulting in a tail carried higher than we would want to see. Top-line rises over the loin (roaching). Moving high in the rear. Nice level, strong topline with tail straight off the back. Would like smoother fit of neck to shoulder. Here is another Gordon with slightly less angulation in the front as compared to the rear which results in a top-line that goes high in the rear, arching. This top-line looks soft in the back, see the swayback look to the top-line as it goes higher in the rear. The croup is too steeply angled causing an improper tail set. Not a very good angle for this shot but top-line appears decent though a bit higher in the rear. Good topline, smooth fit into shoulder, strong level back, with tail set straight off the back as croup is properly angled. Neck and shoulder need to fit together a bit more smoothly, top-line is nice and level until reaching the croup which is too steep causing tail set to be too low. This top-line showing a dip and a slight arch over the loin. Time for all of you to chime in with questions, comments, or additions to the information this is meant to be a quick easy lesson and by no means covers all we need know about movement and structure, that’s what the comment boxes are for…share your input and ask your questions! 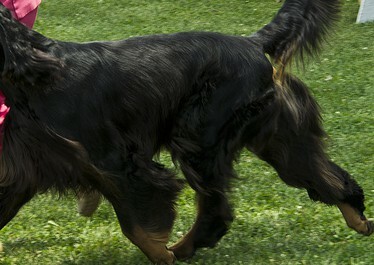 Reblogged this on Gordon Setter Expert. Christine Eilersen: Yes Jenny absolutely, but as you say there are other anatomical dips which also affects a good toppline = good movements, and although this was Gordon, so there is something to learn by pictures that is how it should look when it is really a good toppline. A good toppline you will see that it is not written when the dog stands still, if it’s good you can see only when they are in motion. Something to think about, perhaps, when talking about the concept of good toppline, in the evaluation context. I do not pretend to be able to evaluate the quality of judging of any breed but a Gordon- maybe judges of other breeds actually use what they feel when they manually go over the dogs. I can only speak having shown Gordons since 1968. I agree that breeders are essentially never fooled. I worked as a starter at a racing greyhound track in Sarasota for three and a half seasons. Greyhounds, that were high in the shoulder or had a moderately sloped topline, had short racing careers. A slightly sloping topline was a consistent feature of the best racers. I only got to see the very best racers at stakes races when the owners got larger purses for winning. The perfectly straight topline was not a feature on the best racing greyhounds. I do recall seeing a few on smaller greyhounds. The show Greyhounds, oh my. The winners, of the races of stakes races, had fronts and rears that worked well together. When the best greyhounds reached top speed, the front end was pulling like someone rowing a boat. A strong front end pulls the greyhound around the corners as drive is slightly reduced. A powerful rear drives the greyhound to top speeds and a good front contributes some. At top speeds, the best racers are using reach and drive, to maintain or increase speed. I agree with the comment that a good moving topline does not tell the whole story. The wording of moderately sloping topline bothers me a bit. Moderately like the Irish Setter? Thank you for sharing your thoughts Jim we do appreciate good dialogue! I too agree that a good moving topline does not tell the whole story, and felt perhaps I should clarify a bit as that was not meant to be the point of the article. A good moving topline is a starting point for a novice to begin looking when learning to identify proper movement (i.e. reach and drive) as IF the dog is moving well the topline will look as described, and from that point we would move our eyes and look for the appropriate reach and drive under the dog. I meant for my point to be that we’d be MOST likely to find balanced reach and drive where the topline is correct. This was meant as a tip for new exhibitors and breeder to help them learn to identify good movement more quickly – a good topline is easier for a novice to learn to see than the reach and drive under the dog, learning being the key word here. As Barb mentions,all parts are connected to the back so most of the time moving faults from improper structure will show up in the topline, except as she mentions, when the dog is equally balanced front to rear, then the topline may appear correct and from there we would need to move our eye on to underneath the dog to determine the actual reach and drive. break down over time. The wording in the Irish standard is different but the meaning appears similar to that in the Gordon standard. Experts, please feel free to jump in here if you have other opinions. My first thoughts when seeing an Irish with an extreme top line when stacked is its either overstretched or its steep in the shoulder. If it moves that way, it’s the shoulder. Sometimes we receive an email inquiry regarding articles and we share those questions and our answers with readers on the site. Because lets be truthful- and admit to the “newbies” that a an experienced/good groomer can flatten a suboptimal topline by thinning over the croup- and putting mousse in the hair at base of tail! In addition, the standard calls for slight slope to tail- and the ones you are calling correct have none. hmm. Thanks for sharing your thoughts Rhonda, we encourage that here! Your question about how we will tackle teaching others to see beneath that coat is raised often. You also allude that coat may be groomed to fool some of the people some of the time, but our experience is that it rarely if ever fools a knowledgeable breeder or judge. There are a multitude of dog breeds that are shown in heavy thick coat, and all require correct structure underneath the coat – extremes being breeds like Old English Sheepdog, Collies, or Poodles to name a few. A trained eye will see beneath the coat, and we as breeder mentors need to help new folks train their eye so they will also see the good and bad qualities, whether covered in coat or on display like a Pointer. We would encourage new folks to study material related to the structure of the dog to get a solid picture of how the dog should look underneath the coat. When we decide to write about fronts assemblies and similar topics the like on this blog we plan to use techniques like those that judges and writers like Rachael Page Elliott use in teaching. You’re right on, that is how the standard reads regarding the croup. I would respond that in “my eye” the toplines I mentioned met the standard. It would be good if you would share photos here to demonstrate what “slight slope to the tail” looks like in your eye?This is a site where we are encourage our readers to express their view, so we want to see and hear what you and others have to say as to your interpretation of the standard? Jerry Nelson: Nice article, I wish I had it when we started showing! Not mentioned is one of the most important lessons I have learned: be able to take constructive criticism and be able to honestly critique your own dog. Thank you for sharing that additional insight Barb, very well put! Dr. Quentin LaHam was a wonderful lecturer, his seminar “The Anatomy of Movement” was so enlightening I actually attended it twice in my early years learning about breeding and showing dogs. Unfortunately, I’ve never found any written publications by Dr. LaHam, however during the 1990’s he also shared the podium with another great teacher Rachael Page Elliott who has authored an excellent book, the latest edition being “Dog Steps – A New Look, 3rd Edition”. Readers can find her books and an excellent DVD on many sites including Dogwise. I was lucky to also attend Rachael Page Elliott’s seminar many years ago at the Midwest Specialty. Her book is a great learning tool. 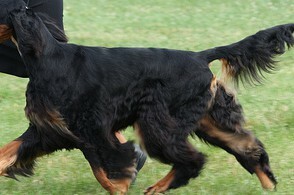 You can get a good moving top line on a dog who is straight front and rear and the back and tail set are correct. That moving top line, to me, is important in determining whether or not angulation is balanced front to rear. Photos, like the examples presented, help tell the story but as Sally said, are not the whole story. In the “old days”, I had the pleasure of attending a two day seminar presented by Dr. Quentin Laham. He believed, and I think he was right, that correct structure could only happen if that top line was correct because the rest of the parts of the dog were either directly or indirectly attached to the back and when the dog moved, everything swung off the back. Correct angulation with long strides, along with that top line, paint a very pretty picture on a moving setter.